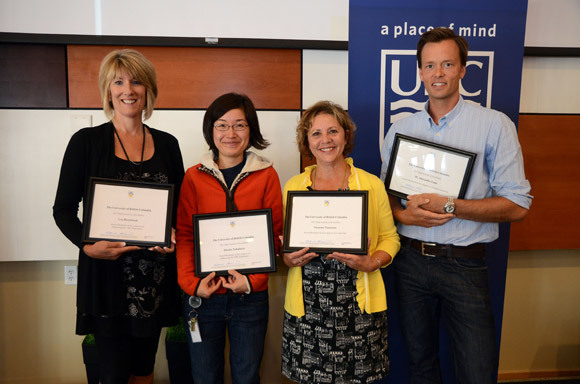 The outstanding contributions of four staff members at UBC's Okanagan campus were celebrated by the university today. The annual Staff Awards of Excellence, which include $2,000 for the recipients, are given in the areas of customer service, leadership, sustainability, and community engagement. The awards recognize those who have gone above and beyond their job description in helping to achieve the goals and objectives of UBC's Okanagan campus. "Not only have these dedicated and hard-working individuals helped to ensure a high-quality educational experience for students, but they also play key roles within their faculties and departments in creating an atmosphere that encourages and supports the professional and personal pursuits of their colleagues and coworkers," says Deborah Buszard, deputy vice chancellor and principal. "Lea's interactions with staff, faculty and other members of the public are always friendly and welcoming and exemplify the professional culture of the university," says her nominator, Roger Wilson, Director of Health and Wellness. "When working with students, Lea anticipates their needs, identifies potential barriers and helps find solutions. She is the go-to person in the areas of finance, computers and human resources, among other topics. Her warm, caring and calm manner sets an example for other staff on the team." "Hiroko is meticulous, organized, conscientious and caring. In her position as lab manager, Hiroko works assiduously to ensure that everything goes according to plan," says Sylvie Desjardins, nominator and head of the Irving K. Barber School of Arts and Sciences, Unit 5. "Her dedication to students and to the physics program in general is exemplary. She is a result-oriented, self-starting dynamo with a passion for students and education and hardly a week goes by that I am not somehow reminded that we are profoundly lucky to have her." "Suzanne is a leader, innovator, teacher and friend. She continually advocates for her department, staff and the campus. With her innate calm intensity she motivates, empowers and directs her staff to make great decisions and leaps of ingenuity," says Nazareno's nominator Jessie Ravnsborg, administrative assistant, Student Housing and Hospitality Services. "Daily Suzanne provides her staff, and those she interacts with, a sense of purpose for the job they are doing and motivation to be better at the job they did yesterday. It is her drive and determination which makes her an exemplary leader within the university." "Alex has been instrumental in the training and supervising of research staff, mentoring of undergraduate and graduate students, and facilitating the research for numerous UBC faculty members," says Susan Murch, nominator and associate professor in the Irving K. Barber School of Arts and Sciences. "Alex has made substantial technical and intellectual contributions to multi-year research programs, and developed novel ideas for successful grant applications and peer reviewed literature. His work has a truly global impact and he gives more than expected every day."